This is our current A-level specification. A-level Law develops knowledge and understanding of the English Legal system. 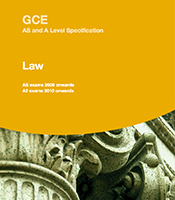 Our A-level Law specification is designed to encourage and engage students to sustain their interest and enjoyment in law.